One of the biggest challenges when designing a small space is combining comfort with style and making it all fit – especially when it comes to seating. Most of the really comfy sofas are oversized, or at the very least large. But when that won’t do, don't forget about the ever-popular, and often pretty, love seat - these days available in many comfortable styles. Did you know that the first loveseat showed up in homes back in the 17th century - surprisingly for the comfort of a woman’s attire, rather than relaxing? Back in the day, this smaller impression of the sofa was invented so that women could sit while comfortably arranging the massive amount of hoops and fabric that made up their gowns. While the loveseat has waned in popularity throughout passing trends, it's (thankfully) never completely gone out of style. Today, there's an even more demand for it as baby boomers are downsizing and young couples are buying smaller first homes or apartments. 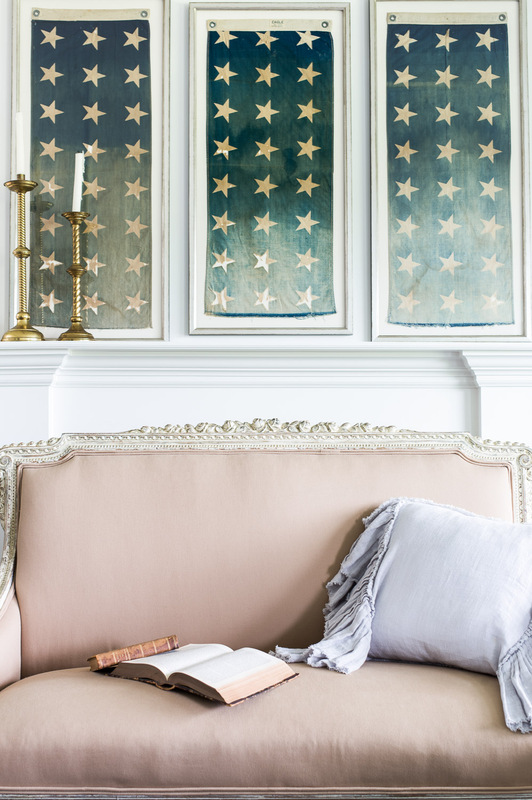 And, this furniture form really does blend beautifully with any decorating style, from farmhouse to fancy. 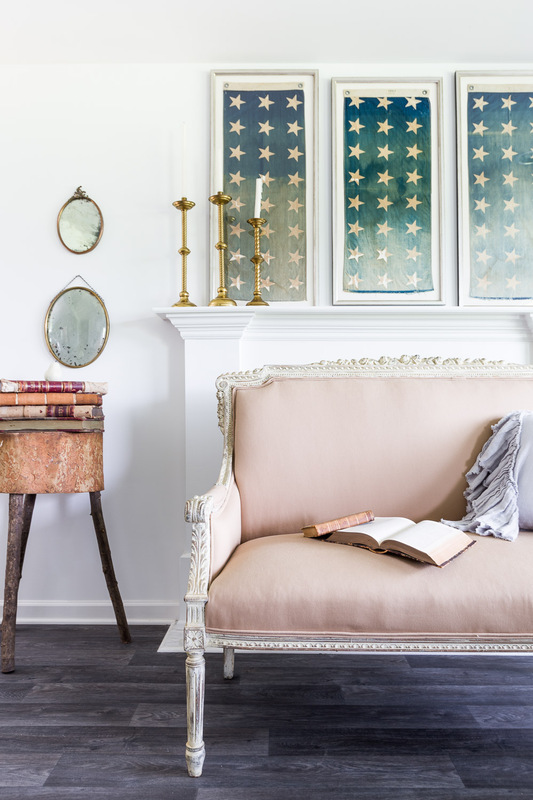 Recently, I chose to use an elegant period French loveseat in a farmhouse space tucked in the countryside of Tennessee (complete with a big white porch!).... and was so inspired, I had to share. I asked my friend Alyssa Rosenheck to run out and take photos -- doesn't she do a beautiful job? Not only was this particular floor plan small, but there were also several features that posed problems.... such as doorways and window placements that limited how I could arrange the room for relaxing. Though the main purpose of the loveseat in the room was to accommodate seating, one way I styled it allowed it to also serve as a divider between the combination kitchen and living room. In both vignettes you'll see below, the size was perfect for allowing plenty of walking room around the other furnishings--and by utilizing the fireplace as a focal point, I was able to create a cozy area that provided both style and functionality in a tiny 100-square-foot living room. 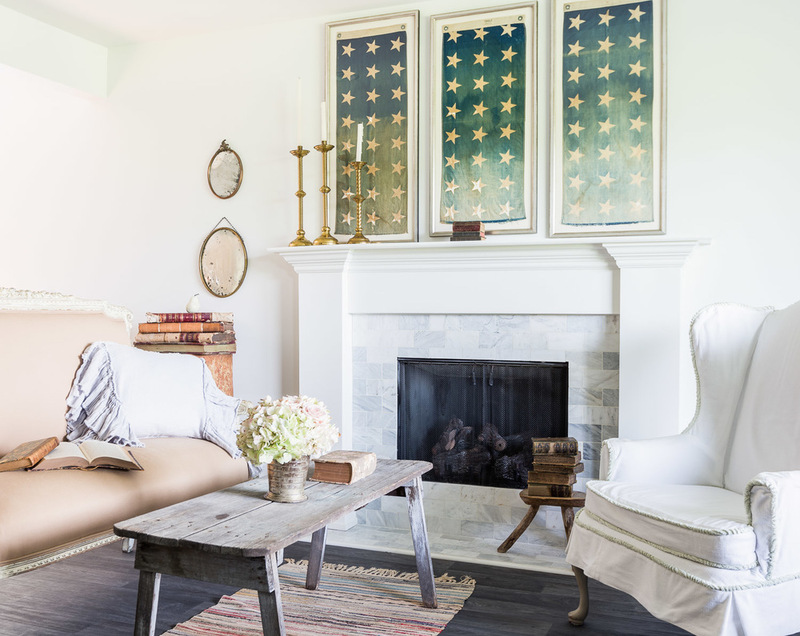 If you don't have the perseverance to uncover the perfect piece at antique stores near you, there are plenty of online resources these days that can help you capture our City Farmhouse style (though you know our pickers have the best eye!). A few of my favorites are here, here, here and here. Those are vintage - so if they're sold out by the time you read this, go to the One King's Lane site here.